Happy Halloween! Last Tuesday was the October edition of IndieWorks, and our annual Halloween Special! As big horror film fans and makers ourselves, Halloween is always a treat for us. 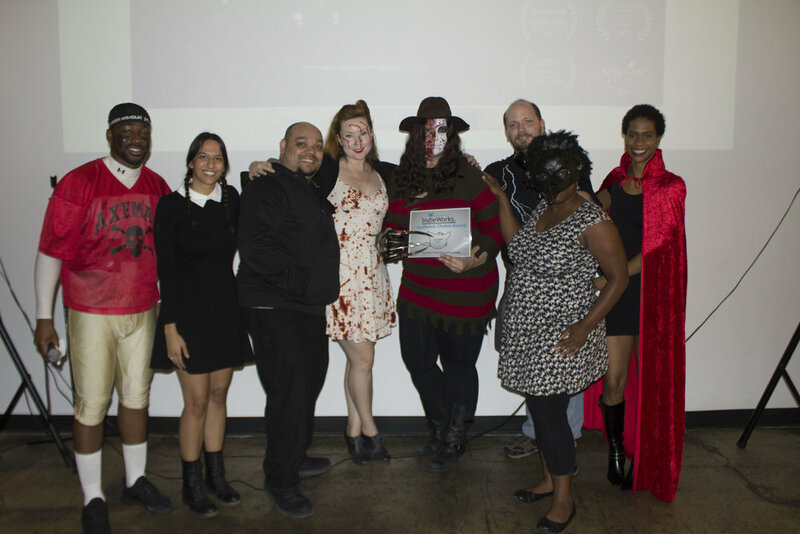 We screened 6 spooky shorts and had 45 people in house. A nice sized crowd considering the rainy evening! The films ranged in style, gore, sub-genre and tone. It was a really fun and eclectic lineup than conveyed the different ways horror can be interpreted and portrayed. Some interesting conversations were had! We'd just like to say thank you to everyone who came out to support the filmmakers and spend the evening with us & them. We do hope you enjoyed all the films and the opportunity to network with other filmmakers and film enthusiasts. We know some connections were made! AND we hope you'll join us again for our November screening on the 14th! On her way home from a late night party, Hannah experiences an unnerving encounter with a stranger who leaves her mentally paralyzed. Sean, an anxious and isolated man, goes about his mundane daily routine with a pleasant twist: an unexpected trip to sunny Brighton Beach. His desire to enjoy the gentle breeze, lapping waves, and sunny skies is put to the test as the beach itself seems to turn against him, culminating in an unexpected and deadly confrontation with a mysterious, demonic creature. Lenora can't wait for Dad to come home to celebrate his birthday. The cake is ready, the balloons are out, and the gifts are piled. Only, where is Dad? A sensitive young woman stalks a romantic rival in this 1970's-revival psychological drama. A man tells a woman on the street to Smile. He lives to regret it. At the end of the evening, we announced our winning filmmakers for both Audience Choice Award & Silver Whiskers Award. The Audience Choice Award is voted upon by all those in attendance, and the Silver Whiskers Award is judged by the CongestedCat Team based on a system rating 8 categories of Story, Dialogue/Writing, Direction, Acting, Cinematography, Sound, Editing, and Production Value, along with a nuanced discussion focused on inclusion and originality. The Silver Whiskers winner goes on to screen again at our end of year Best of Fest screening next April. Audience Choice Award: "The Run-In"
Join us next month for our November edition on the 14th!